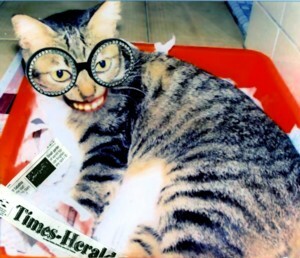 Mr. Scratchy LOVES the Times Herald. He Loves its texture on his little paws. Silky, Smooth, and Blissfully Devoid of Real Content or Journalistic Integrity. 1)If my poo-poo is in the vacuum of outer space does it still smell? 2)Why did those monkeys get the opposable thumbs and can openers? You get Mr. Scratchy's drift. He's one smart cat. Click HERE for his breakdown of a little nugget that appeared in the local litter box liner recently.